Live TV is the biggest contributor to a decrease in total time spent connected to media. 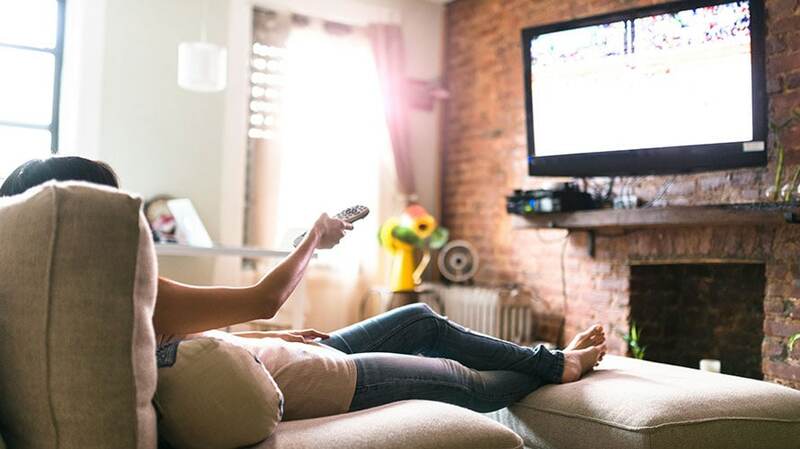 The number of people who subscribe to a live TV streaming service like Sling or YouTube TV is on the rise, but those increases aren’t enough to compensate for the increase in cord-cutting as more consumers ditch their traditional cable subscriptions. That’s according to the Q2 2018 Nielsen Total Audience Report, which was released today and sheds new light on how we’re consuming media—and how much of it we’re watching. The report found that the percentage of U.S. TV households with access to a virtual multichannel video programming distributors (vMVPD) increased from 1.4 percent of all TV households in June 2017 to 3.4 percent this June. 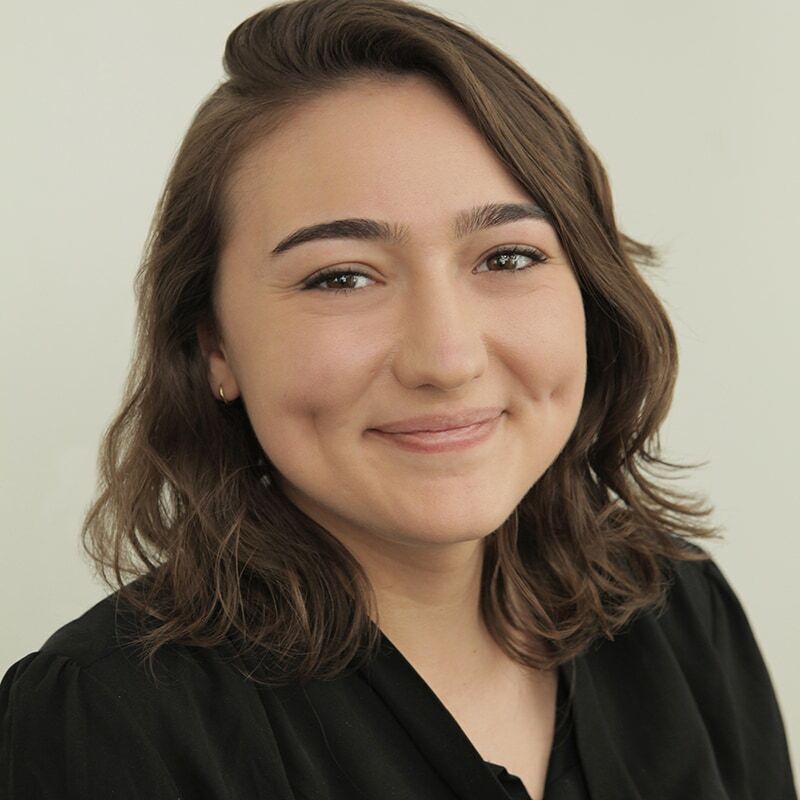 But the percentage of households with traditional cable access fell in that same timeframe, from 81.3 percent in 2017 to 77.4 percent in 2018. That means the percentage of households with total multichannel access (traditional cable or vMVPD) declined from 82.7 percent in 2017 to 80.8 percent this year, indicating that live TV streaming service subscriptions can’t stem the industry’s losses from cord-cutting. 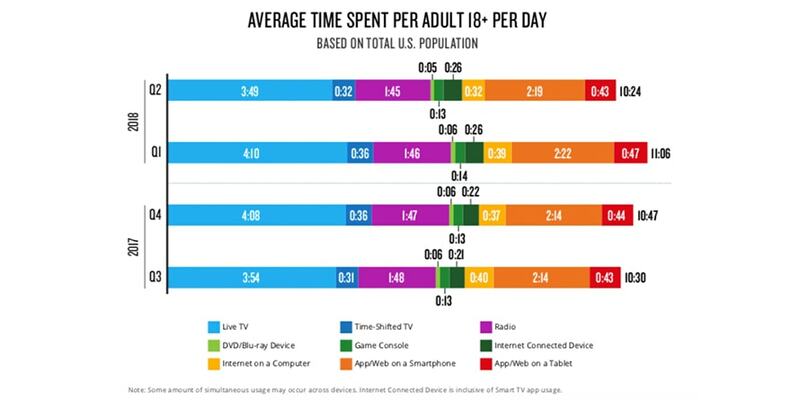 In the U.S., adults now spend 10 hours and 24 minutes each day consuming media. What gets interesting is how each age demographic compares to one another. For example, adults aged 50 to 64 spend more time per day on media than any other age group. Those who are 65 and older consume the most live and time shifted TV than any other demographic, but don’t interact as much with smartphone applications and web viewing. As always, seasonality plays into how much media audiences are consuming. 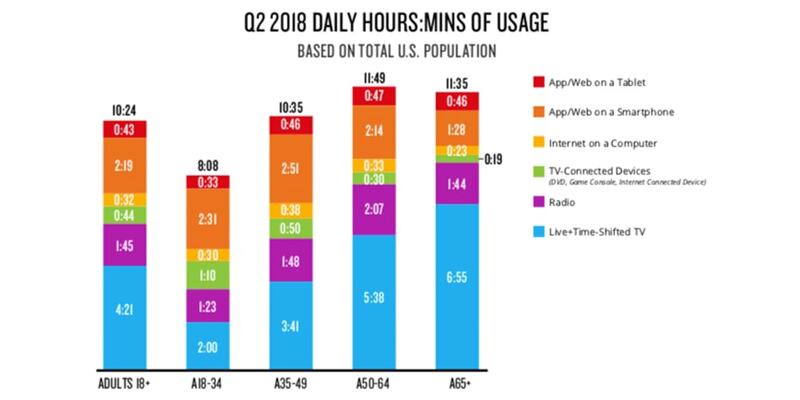 Live TV is the biggest contributor to a decrease in total time spent connected to media, from more than 11 hours in the first quarter of 2018 to the more than 10 hours found in the second quarter. Compared year over year, the amount of live TV viewing also decreased. Accessing applications or the web via smartphones accounted for the second-largest chunk of time throughout each quarter. Overall, video use among adults clocked in at five hours and 24 minutes per day. Seasonality can lead to fluctuations to this figure, such as large-scale sporting events. 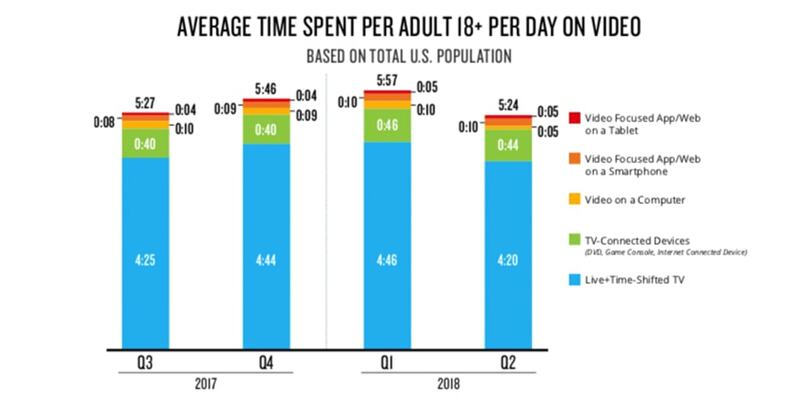 Despite this, video viewing on smartphones and tablets remained steady, while live and time-shifted TV as well as TV-connected devices saw the most fluctuations. The complete Q2 2018 Nielsen Total Audience Report can be found here.